Ruiz Food Products of Denison, Texas, is recalling approximately 2.491 million pounds of ready-to-eat meat and poultry taquitos. The products may be contaminated with Salmonella and Listeria monocytogenes. NutriZone of Houston, Texas, is expanding its earlier recall of various kratom dietary supplements to all lots sold. Northwest Naturals of Portland, Ore., is recalling frozen chicken and salmon pet food chubs. Earlier this week, the Centers for Disease Control and Prevention (CDC) reported that an antibiotic-resistant salmonella outbreak began spreading from chicken and has since infected 92 people across 29 states. The Food and Drug Administration (FDA) is currently investigating the outbreak and reported 21 hospitalizations so far, though no deaths have been reported. 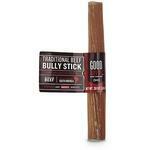 Redbarn Pet Products of Long Beach, Calif., is expanding its earlier recall of dog chews to include all lots of the product. The recalled products were sold in pet specialty and grocery retail stores nationwide. Bravo Produce of San Ysidro, Calif, is recalling Maradol Papaya, grown by Productores y Exportadores de Carica Papaya de Tecomán y Costa Alegre SPR of RL and packed by Frutas Selectas de Tijuana, S. de RL de CV. The product has tested positive for Salmonella. Triple T Specialty Meats of Ackley, Iowa, is recalling approximately 20,630 pounds of ready-to-eat chicken salad. 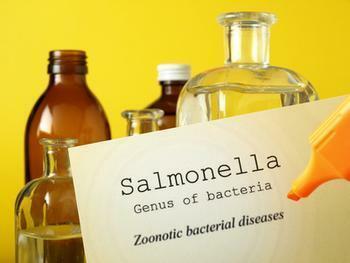 The products may be contaminated with Salmonella Typhimurium. GH Foods CA of Sacramento, Calif., is recalling approximately 987 pounds of ready-to-eat salad with chicken. Tamarack Inc., of Roy, Utah, is recalling Eclipse Kratom-containing powder products that may be contaminated with Salmonella. The recalled powder products are packaged in plastic heat sealed pouches or plastic sealed bottles and sold in one gram capsules and powder. An estimated 120 units were sold directly to five retailers in Utah. 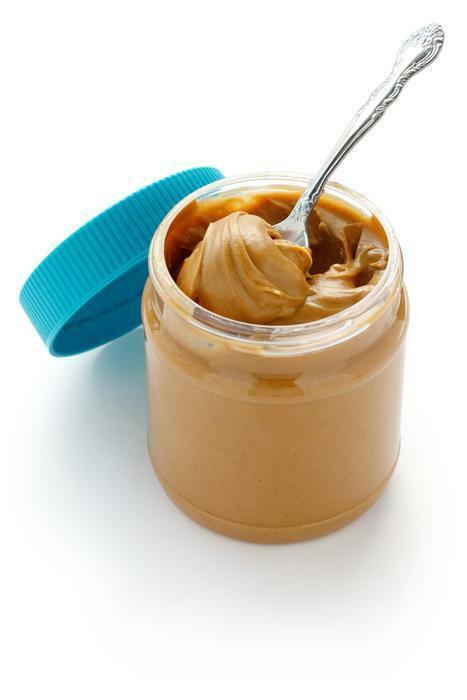 nSpired Natural Foods is voluntarily recalling certain retail lots of Arrowhead Mills Peanut Butters, MaraNatha Almond Butters and Peanut Butters and specific private label nut butters packaged in glass and plastic jars. The company has received reports of four illnesses that may be associated with these specific products. MaraNatha Roasted Creamy Almond Butter 26 oz. MMaraNatha Organic Creamy Peanut Butter with Salt 26 oz. The use-by date can be found on the top of the jar lid. The company is currently working with customers and retailers to remove and destroy products with the above use-by dates from store shelves and warehouses. Products were distributed across the U.S.,, Canada, Hong Kong, United Arab Emirates, and Dominican Republic, and also were available for purchase on the Internet. Consumers need not return the product to the store where it was purchased. Instead, they should dispose of it and the container. Consumers may contact the Company at 1-800-937-7008 between 8:00 AM and 8:00 PM CST for a replacement or refund, and with general inquiries. Frontier Co-op is recalling several of its products manufactured with organic garlic powder and sold under its Frontier and Simply Organic brands, and one product sold under the Whole Foods Market brand. Frontier Powdered Garlic, Certified Organic 4171, 4238, 4297, 4325, 4342, 5033 0-89836-80352-8 400 oz./11.3 kg/ 25.0 lbs. Frontier Vegetarian Broth Powder No-Chicken, Certified Organic 4178, 4336, 5007, 5036 0-89836-82869-9 400 oz./11.3 kg/ 25.0 lbs. The recalled products were sold to distributors, retailers and consumers in all 50 states and in some parts of Canada. On foil bulk packages, the four-digit lot code will be found on the front label directly above the UPC code. On bottled items, the four-digit lot code is found on the bottom of the bottle. On seasoning mixes, the four-digit lot code is embossed on the right side of the packet. Consumers should not consume these products, but should either throw away any remaining products or return them to the place of purchase for a refund. Consumers may contact Frontier Co-op at 1- 800-669-3275 Monday through Friday from 8:00 a.m. to 5:00 p.m. CT. 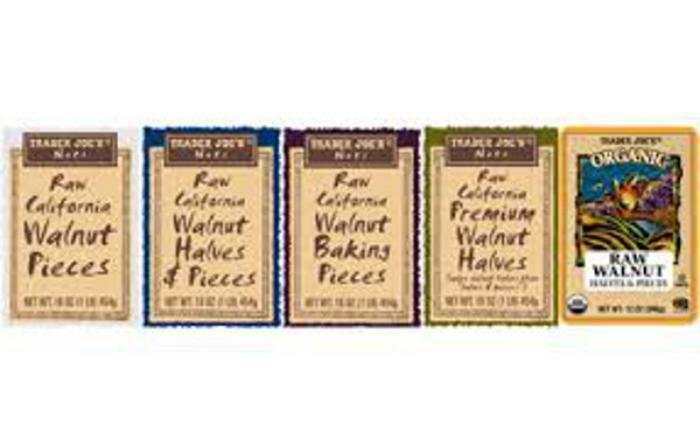 Trader Joe’s is recalling its brand of raw walnuts because they have the potential to be contaminated with Salmonella. The company says it has not received any illness complaints related to these recalled products. The products are packaged in clear plastic bags with the UPC Codes printed on the back. For the Raw California Walnut products, the “BEST BY” dates and Lot Numbers can be found printed on the back of the packages. For the Organic Raw Walnut products, the “BEST BY” dates can be found printed on the front of the packages. The products were distributed to Trader Joe’s stores nationwide. Customers who have purchased any of the recalled products should not eat it, and dispose of it or return it to any Trader Joe’s for a full refund. Consumers with questions may contact Trader Joe’s customer relations at (626) 599-3817 Monday through Friday, 6:00AM to 6:00PM PST. 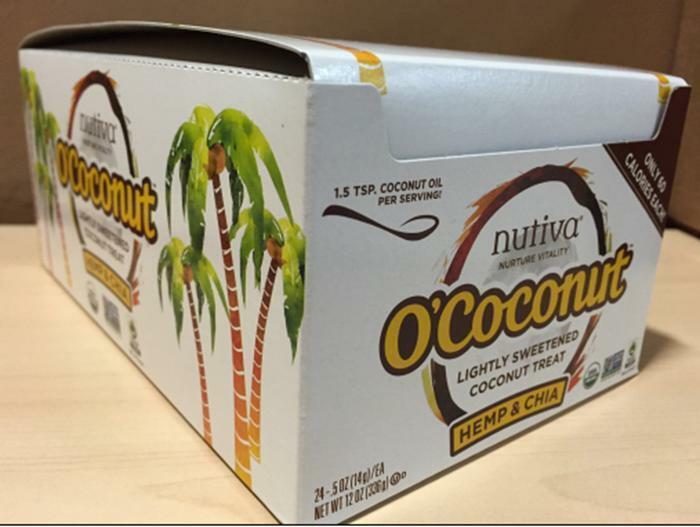 Nutiva, which bills itself as an “organic superfoods company,” is recalling 3 of its O’Coconut items. The latter two items (BAR202 & BAR302) were distributed via Nutiva.com or as samples only. Customers with questions or who would like product replacements or refunds may call (800) 993-4367 or email help@nutiva.com. Aurora Products is recalling certain lots of natural walnuts and trail mixes containing walnuts. 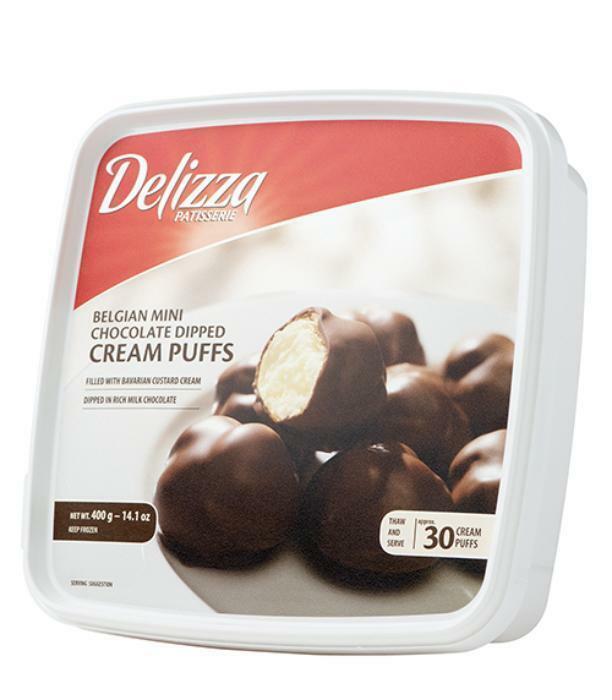 The recalled products were distributed through retail stores nationwide and in Canada and Bermuda. Consumers who have the products listed below should not eat them and destroy them or return them to the place of purchase. Consumers with questions may contact Aurora Products at (800)-898-1048 between 9:00AM – 5:00 PM, EST, Monday – Friday. Aurora Products is expanding its earlier nationwide recall of certain lots of natural walnuts and trail mixes containing walnuts. The products may contain Salmonella. Private label products that use store branded labeling include: America Choice, Belmont Market, Boiceville Market, Gaul’s Market, Green Hills Market, Harvest Co – Op Market, Hurley Ridge, Lees, Miles Market, Palmers Market, Union Market, Walter Stewart , Windfall Market and Wild Acorns. Consumers who have the recalled products should not eat them, but destroy them or return them to the place of purchase. Customers with questions may contact Aurora Products at (800)-898-1048 between 9:00AM – 5:00 PM EST Monday – Friday. No illnesses have been reported in relation to this product to date. The recalled products were distributed to HEB Grocery Stores in Texas and sold between 12/15/2014 and 3/20/2015. Customers who purchased any of the recalled products are urged to not eat or discontinue consuming them and contact the company for refund or product replacement information at 1-844-571-5555 from 8:30am to 5:30pm Monday-Friday, CST. 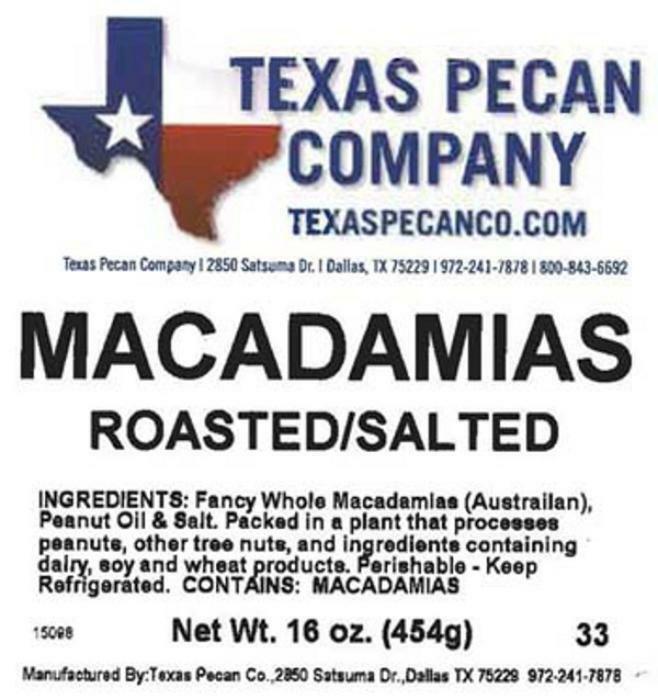 Texas Pecan Company of Dallas, Texas, is recalling a variety of macadamia nuts and nut products. The recalled products were distributed in company retail stores nationwide and through mail orders. The products come in an 8-oz. and 16-oz clear plastic bags and in gift tins identified as The Executive, Junior Executive, Sweet-N-Salty and Mini Sweet-n-Salty, and were sold in November and December 2014. The pack date of 14320 through 14365, is located on the bottom left hand corner of the label. Consumers with questions may contact the company at 972-241-7878, Monday thru Friday from 8:30 am – 5:00 pm CT.
Kanan Enterprises is recallig Peterson's macadamia nuts. 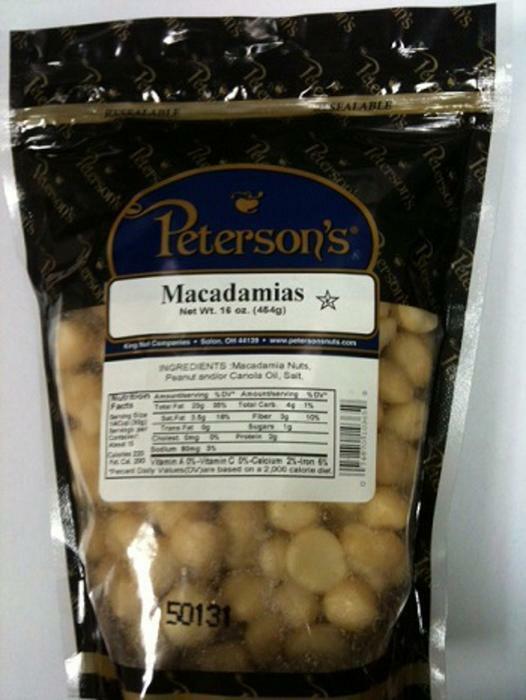 Peterson’s Macadamias in 16-oz stand-up pouches, were distributed only through the Peterson Nut Store in Cleveland, Ohio, and King Nut Factory outlet in Solon, Ohio. Consumers who have the recalled product should not consume it, but destroy it or return it to the place of purchase. Consumers with questions may call 1-800-860-5464, 8:15 am – 5:00pm EST, Monday – Friday. Waymouth Farms of New Hope, Minn., is recalling raw pine nuts in various sizes. No illnesses have been reported to date in connection with the problem. The 4-oz. bags listed above may have been sold as a floor display, UPC 30243 86683 with a date range of September 5, 2015, to February 4, 2016. This bulk product would have been sold from bulk self-service grocery bins. Consumers with questions may contact customer service at 800-527-0094 Monday through Friday, 8:00 AM to 4:30 PM, CST. 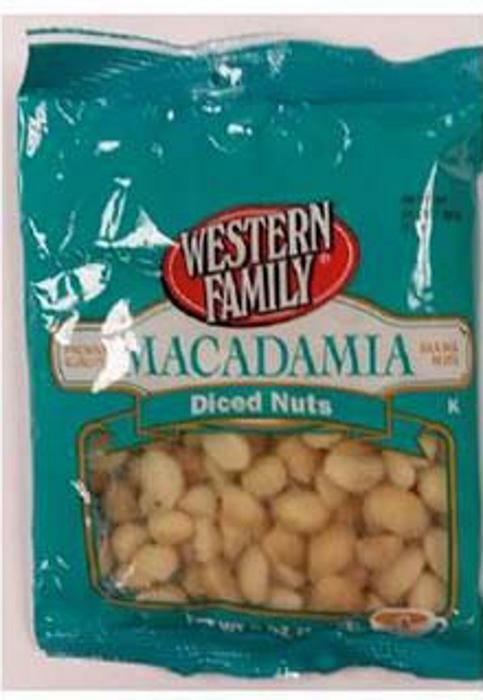 Aurora Products is recalling raw macadamia nuts packaged under the Aurora brand label and various store brand labels. The recalled products were distributed to retail stores in Connecticut, District of Columbia, Delaware. Kentucky, Massachusetts, Maryland, Maine, New Hampshire, New Jersey, New York, Ohio, Pennsylvania, Rhode Island, Virginia and West Virginia. Consumers who have the recalled products listed below should not eat them, but destroy them or return them to the place of purchase. Customers with questions may contact Aurora Products at (800)-898-1048 between 9:00AM – 5:00 PM EST. Monday – Friday. Private Label Products That Use Store Branded Labeling Include: Belmont Market, Citarella, Ernest & Klein, Gourmet Garage, Harvest Co – Op Market, Le District, Lees, Palmers Market, Walter Stewart, Whole Food Market and Wild By Nature. 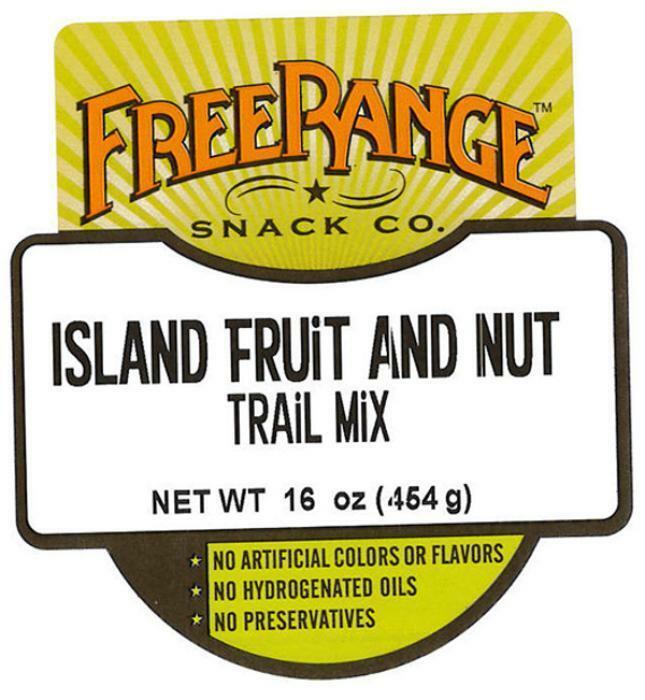 Rocky Mountain Foods is recalling certain lots of Island Fruit and Nut Trail Mix packaged under the Free Range Snack brand, and certain lots of bulk macadamia nuts. Consumers who purchased the recalled products should not consume them and return them to the store where purchased for a full refund or replacement. The products were sold at stores in Arizona, Colorado, Kansas, New Mexico, Oklahoma , Texas, Utah and Wyoming. Consumers with questions may contact Rocky Mountain Foods customer service at (303) 371-3511 Monday through Friday from 9:00 AM to 5:00 PM., MT. The Kroger Co. is recalling Kroger Ground Cinnamon, Kroger Garlic Powder, Kroger Coarse Ground Black Pepper and Kroger Bac'n Buds sold in its retail stores. No illnesses have been reported to date in connection with these products. Stores under the following names in the 31 states where Kroger operates are included in this recall: Kroger, Ralphs, Food 4 Less, Foods Co., Fred Meyer, Fry's, King Soopers, City Market, Smith's, Dillons, Baker's, Gerbes, Jay C, Ruler Foods, Pay Less, Owen's, and Scott's. Customers who purchased the recalled products should not consume them and should return them to a store for a full refund or replacement. Customers with questions may contact Kroger at 1-800-KROGERS. 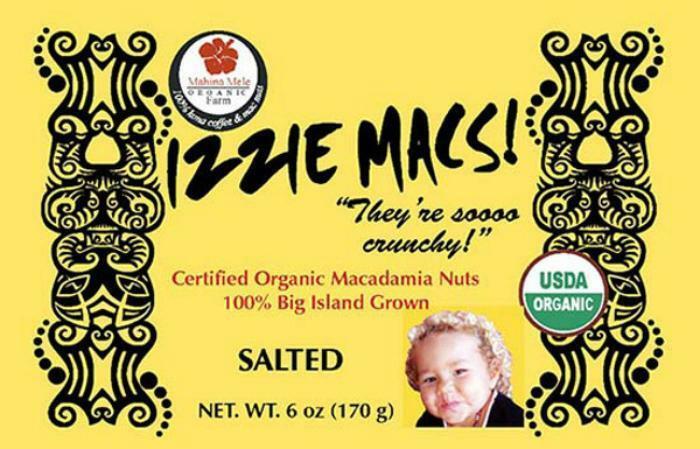 Mahina Mele Farms is recalling its macadamia nut products after FDA testing found Salmonella in them. No illnesses have been reported in connection with these products to date. Customers who purchased the recalled products should not consume them and should return them to the store where purchased for a full refund or replacement. Consumers with questions may call 808 328 8987. Texas Star Nut and Food Co. is recalling Nature’s Eats, Natural Macadamia Nuts and Southern Grove, Simply Raw Trail Mix. The products, sold between June 20, 2015, and September 9, 2015 were distributed to retail locations in Texas, North Carolina, Florida, Georgia and Tennessee. Customers who purchased the recalled products should not eat or discontinue eating them. Consumers may contact the company at 1-844-571-5555 for refund or product replacement information from 8:30am – 5:30pm Monday – Friday, (CST). 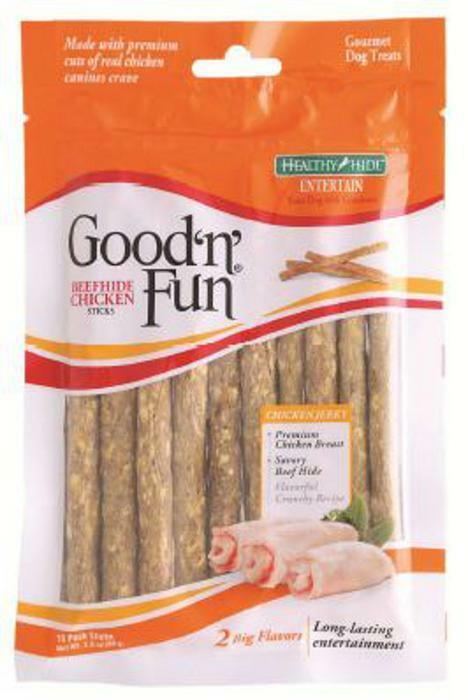 Salix Animal Health of Deerfield, Fla., is expanding its earlier recall of "Good 'n' Fun - Beefhide Chicken Sticks" to include the tested lot and others made around the same timeframe. The following products, packaged in a 2.8-oz bag stamped on the back side with an item code number of 82247 and an expiration date ranging from 02/2018- 07/2018, are being recalled. The recalled products were distributed nationwide to Dollar General, Dollar Tree and Family Dollar retail stores. Consumers who have this product should dispose of it or return it for full refund. Customers should contact Salix Animal Health’s consumer affairs team at 1-800-338-4896, Monday through Friday between 8:30 AM – 5:00 PM (EST) for a refund. World Variety Produce of Los Angeles, Calif., is recalling two- and three-oz. 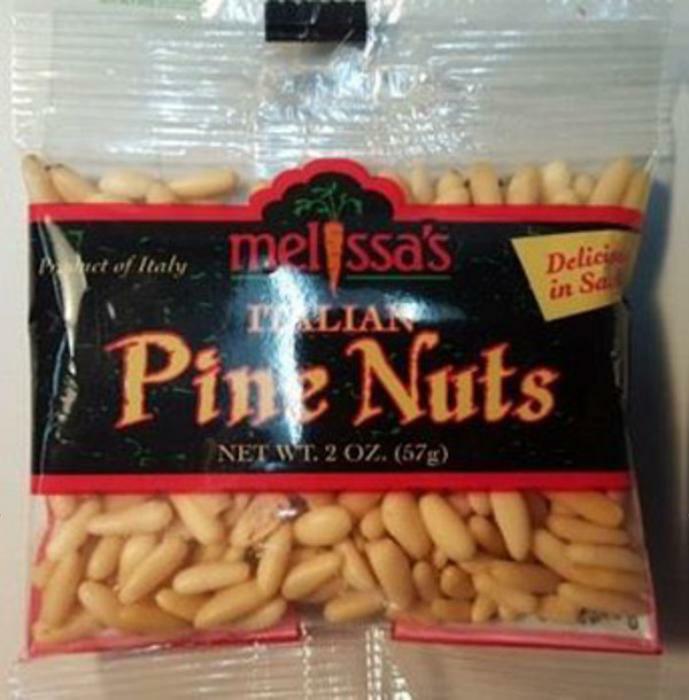 Containers of Italian Pine Nuts. The recalled products were sold by retailers in Arizona, Arkansas, California, Florida, Georgia, Illinois, Kansas, Kentucky, Maryland, Massachusetts, Michigan, Minnesota, Missouri, Nevada, New Jersey, New York, North Carolina, North Dakota, Ohio, Oklahoma, Oregon, Pennsylvania, Tennessee, Texas, Virginia and Washington. Customers who purchased the recalled products should destroy and dispose of them. Consumers with questions may contact the company at hotline@melissas.com or call 1-800-588-0151, Mon-Fri 6:00 AM–6:00 PM PST. JEM Raw Chocolate of Bend, Ore., is recalling its full line of all nut butter spreads. There have been eleven (11) illnesses reported but no deaths or hospitalizations to date. 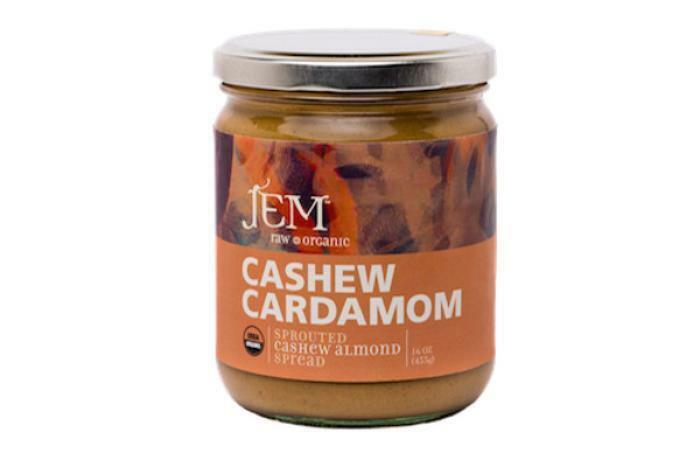 In light of this investigation, and with an abundance of caution, JEM Raw has initiated a voluntary recall of all products and sizes, packaged in glass jars, and sold under brand name JEM Raw Organics. The recalled products were distributed in retail stores nationwide and through mail order between June 2015, and November 2015. Customers do not need to return the product to the store where it was purchased. Instead, they should discard any product and its container. The company will work directly with each consumer to manage replacement of its product. Consumers with questions may contact JEM Raw Chocolate at (541) 728-3844 from 9am – 4pm (PST) Monday through Friday or online at www.jemraw.com. Chamberlain Farm Produce, Inc., of Owensville, IN, is recalling all of its cantaloupes from the 2012 growing season that may remain in the marketplace. This recall is occurring because of concern some cantaloupes may be contaminated with Salmonella, an organism that can cause serious and sometimes fatal infections in young children, frail or elderly people, and others with weakened immune systems. This recall follows a prior market withdrawal of all Chamberlain Farm Produce cantaloupes that occurred August 16 and 17. During the period June 21 to August 16, the company marketed cantaloupes to four retail grocery stores with grocery store retail outlets in Vanderburgh, Warrick, Gibson, and Dubois County, Indiana, and Wabash County, Illinois; and also to four wholesale purchasers located in Owensboro, Kentucky, St. Louis, Missouri, Peru, Illinois, and Durant, Iowa, respectively. As a part of the market withdrawal, Chamberlain Farm Produce notified all of the purchasers of its cantaloupes to take immediate action to remove all cantaloupes from the marketplace, and all of the purchasers confirmed compliance with that request. The CDC reports that for the period July 7 through August 22, there have been reports of some 178 people nationwide who may have become sick in connection with consumption of cantaloupes. The FDA investigation is continuing and incomplete at this time. After discussion with the FDA, Chamberlain Farm Produce decided to conduct the recall as a precautionary measure. Consumers should inquire about the source before purchasing additional cantaloupes or using those already purchased. To be absolutely certain, consumers should destroy any cantaloupes currently in their possession the origin of which cannot be identified. 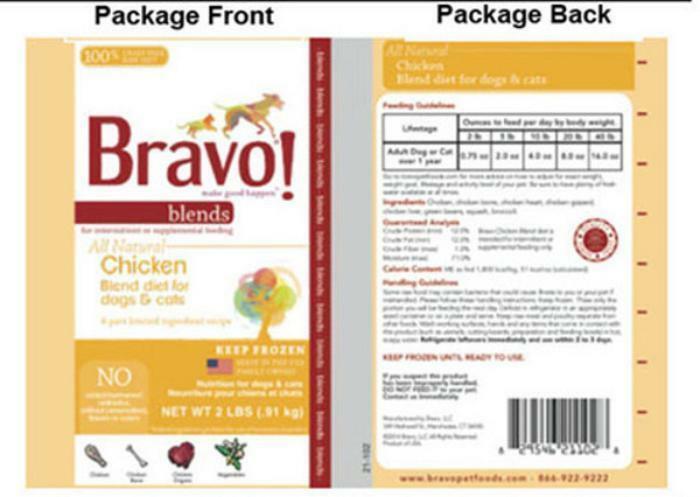 Bravo Pet Foods of Manchester, Conn., is recalling a select lot of Bravo Chicken Blend diet for dogs & cats with a best used by date of 11/13/16. Three additional items that did not test positive for Salmonella, but were manufactured on the same day, are also being recalled. Pets with Salmonella infections may be lethargic and have diarrhea or bloody diarrhea, fever, and vomiting. Some will have only decreased appetite, fever and abdominal pain. Infected but otherwise healthy pets can be carriers and infect other animals or humans. The products were sold to distributors, retail stores, Internet retailers, and directly to consumers in the U.S. The recalled product should not be sold or fed to pets, but disposed of in a safe manner. http://www.bravopetfoods.com/consumerrecall.html for a full refund or store credit. Consumers with questions may contact Bravo toll free at (866) 922-9222 Monday through Friday, 9:00 am – 4:00 pm (EST) on online at at http://www.bravopetfoods.com/. DFI Marketing of Fresno, CA, is recalling cantaloupe because it has the potential to be contaminated with Salmonella. Salmonella was found on a single sample of cantaloupe during routine testing conducted at a wholesale produce distribution center (terminal market) as part of a USDA testing program. No illnesses have been reported. It has been determined the suspected cantaloupes include approximately 28,000 cartons of bulk-packed product. 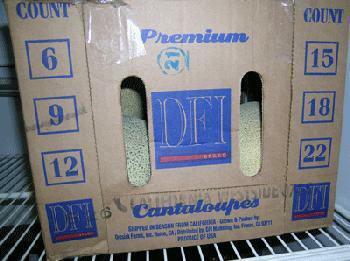 The cantaloupes are packed in 6, 9, 12, 15, or 18 cantaloupes per carton. The cantaloupes were packed on August 26, 2012. They may have been distributed from August 27 to September 10, 2012, primarily to retail customers in the following states and one country: Alabama, Arizona, California, Colorado, Florida, Georgia, Idaho, Illinois, Indiana, Kansas, Kentucky, Maine, Michigan, Minnesota, Missouri, Nevada, New York, Oklahoma, Tennessee, Texas, Virginia and Mexico. It is believe that, due to the perishable nature of cantaloupe, the majority of the recalled product is no longer on the market. Retail customers who may have received this product should contact DFI Marketing Inc. Consumers who may have this product should discard it or return it to the store where they purchased it. Consumers with questions can the company at 1-559-449-0244 24 hours a day. 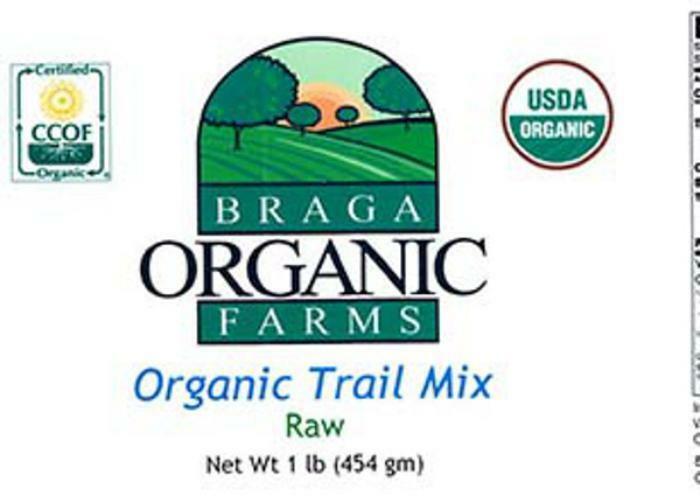 Braga Organic Farms is recalling pistachios and products containing pistachios. The nuts may be contaminated with Salmonella. 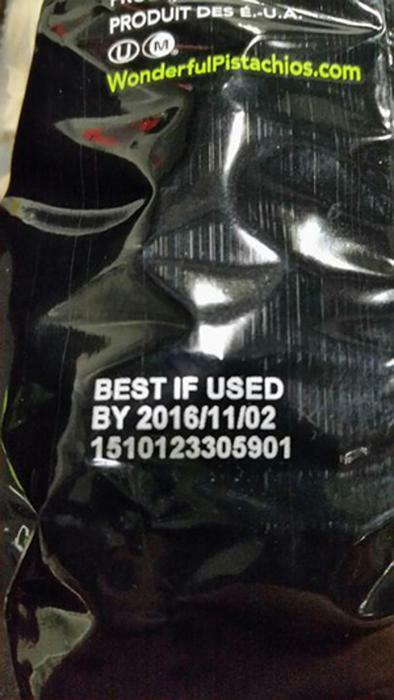 The recalled nuts, which come in a clear or green standup bag, with the date code stamped on the bottom of the bag, were distributed in retail stores in California, Oregon and Washington, and through online sales nationwide. Customers who purchased the recalled products should not consume it, but destroy them or return them to the place of purchase. Consumers with questions may call 855-661-2101, 8:15 am – 4:30 pm, (PST), Monday through Friday. 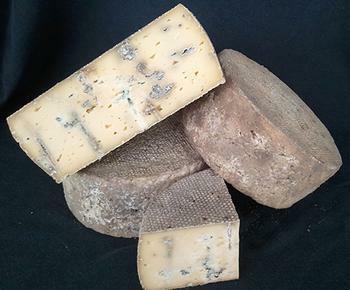 Flat Creek Farm & Dairy of Swainsboro, Ga., has recalled 200 pounds of Heavenly Blue cheese. The product is potentially contaminated with Salmonella enteritidis, which can cause serious and sometimes fatal infections in young children, frail or elderly people and others with weakened immune systems. The company says that as of November 27, 2013, all of the purchasers have been notified and more than 90% of the product has been collected or destroyed. Heavenly Blue was distributed in certain parts of Alabama, Georgia and Florida via and online. 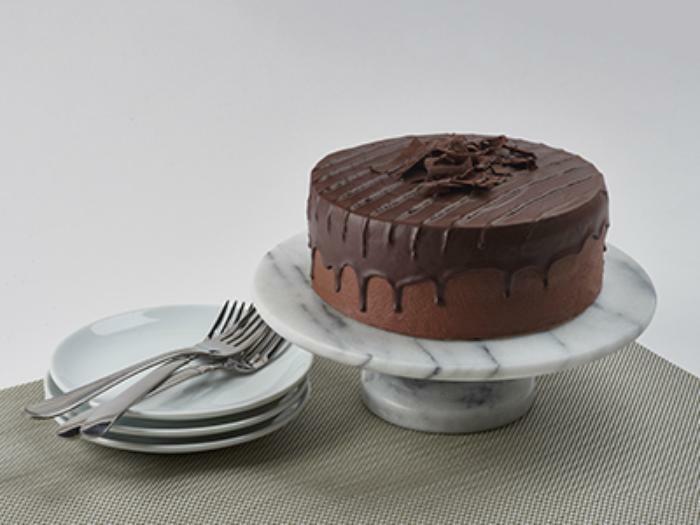 The product is packed in clear plastic and ranges in sizes from 1/2 pound to whole wheels. The recall is specific to product marked with the lot code 130912XHB, which can be found on the front of the package. Consumers who have purchased this product are urged to return it to the place of purchase. Consumers may call Flat Creek Dairy & Farm at 478-237-0123 from 8:00 a.m to 5:00 p.m. EST for more information. 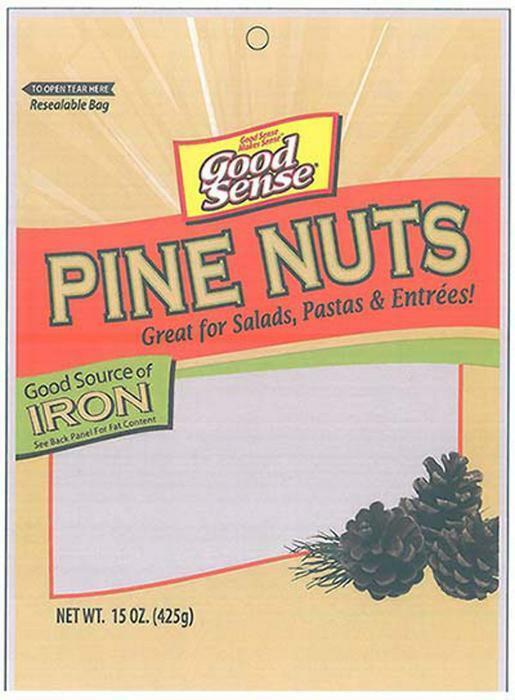 PMI Nutrition of Arden Hills, Minn., is recalling its 20 lb. 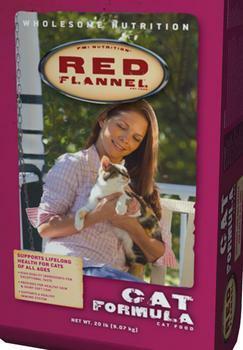 bags of Red Flannel Cat Formula cat food for possible Salmonella contamination. There have been no reports of illness related to this product to date. Red Flannel Cat Food was sold through dealers to customers in Alabama, Georgia, Iowa, Illinois, Indiana, Kentucky, Massachusetts, Maryland, Michigan, Minnesota, Mississippi, North Carolina, North Dakota, New Jersey, New York, Ohio, Pennsylvania, South Carolina, Tennessee, Virginia, Vermont, Wisconsin and West Virginia. UPC code is 7 42869 00058 5. Customers should immediately discontinue use of and return the product to their dealer for a full refund or replacement. For more information, customers can contact the customer service line for PMI products at 1-800-332-4738 Monday through Friday from 8 a.m. to 4:30 p.m. CST. 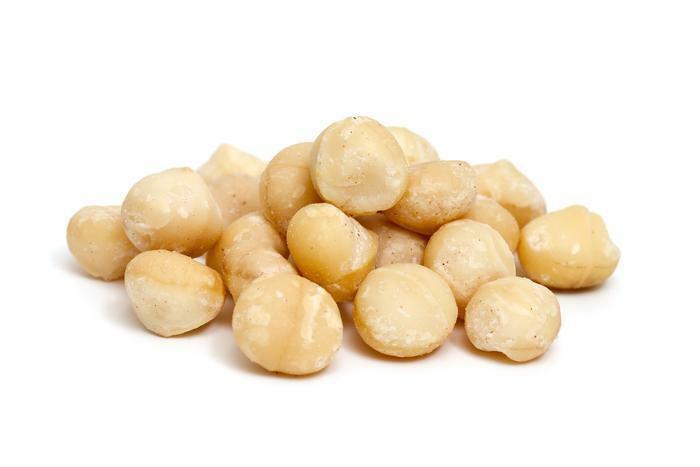 Marathon Ventures is recalling various retail and bulk packages containing raw macadamia nuts. There have been no illnesses or injuries reported to date affiliated with these products. Customers who purchased the recalled items should not consume them, but return them to the place of purchase for a full refund or replacement. Consumers with questions may contact Marathon Ventures at (402) 934-8223 Monday through Friday from 8:00 AM to 4:30PM (CT) or by e-mail at qa@marathonventuresinc.com. Big Red Tomato Packers of Fort Pierce, Fla., is recalling 790 - 20 and 25-lb. 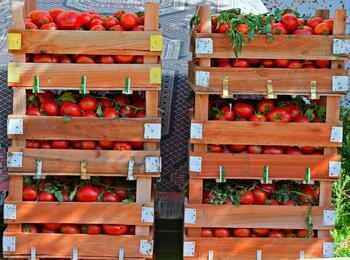 boxes of fresh tomatoes of lot 1106. The tomatoes have the potential to be contaminated with Salmonella. There are no known illnesses associated with this lot number. Tomatoes from the lot were distributed to a limited number of receivers in Florida, North Carolina, Michigan, Minnesota, Pennsylvania and Tennessee. All receivers have been notified. The potential for contamination was discovered as the result of a routine random lot sample taken on January 28, 2014. All currently existing product associated with this lot number is subject to this recall. Consumers with questions may contact Erin Cox at 772-466-0700 or erin@bigredtomatopackers.com. Wonderful Pistachios is recalling a limited number of flavors and sizes of in-shell and shelled pistachios. The products, distributed through several retailers across the U.S. and in Canada, can be identified by a 13-digit lot code number that can be found on the lower back or bottom panel of the package. Customers may return the recalled for a refund by sending the product back or bottom portion of the package that contains the lot code to Wonderful Pistachios, 13646 Hwy 33, Lost Hills, CA 93249. They may also return the product to the store from which it was purchased for a refund. The nuts should be discarded prior to the return of the entire package or lot code panel to the retail store. Consumers with questions may call (844) 505-3844, 24 hours per day, 7 days per week. Infinite Herbs of Miami, Fla., is recalling one lot of its 2.5-ounce packages of Organic Basil because of potential contamination with Salmonella. The recall affects one specific lot of Infinite Herbs brand Organic Basil packaged in 2.5-ounce clamshell bearing the "Date Packed 02/21 20422". The "Date Packed" information can be found on the back side label below the country of origin statement. The product was distributed to Trader Joe's stores in Florida, Georgia, Louisiana, North Carolina, South Carolina, Southern Virginia and Tennessee. Consumers who have purchased the recalled product are urged not to eat the product, and to dispose of it or return it to the place of purchase for a full refund. Consumers with questions may contact the company at 305-599-9255 or via email at customer_service@infiniteherbs.com. Texas Star Nut & Food Company is expanding its previous recall of pistachios. No illnesses have been reported in relation to these products at this time. The recalled products were sold through retailers nationwide between August 13, 2015, and February 24, 2016. Customers who purchased any of the recalled products should discontinue consuming them and return them to the place of purchase for a refund. Consumers with questions may contact the company at 1-844-571-5555 from 8:30am to 5:30 pm (CST). 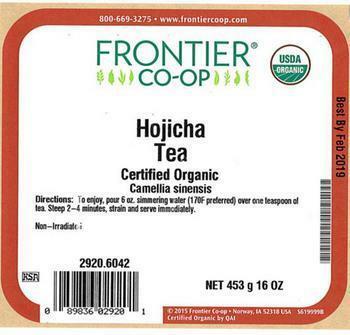 Frontier Co-op is recalling its Organic Hojicha Tea which may be contaminated with Salmonella. No illnesses have been associated with these products to date. The four-digit lot code on the foil bulk packages follows the item number (#2920) on the front label directly above the UPC code. Customers should not consume these products and either throw them away or return them to the place of purchase for a refund. Consumers with questions may contact Frontier Co-op at 1-800-669-3275 Monday through Friday from 8:00 a.m. to 5:00 p.m. (CT). 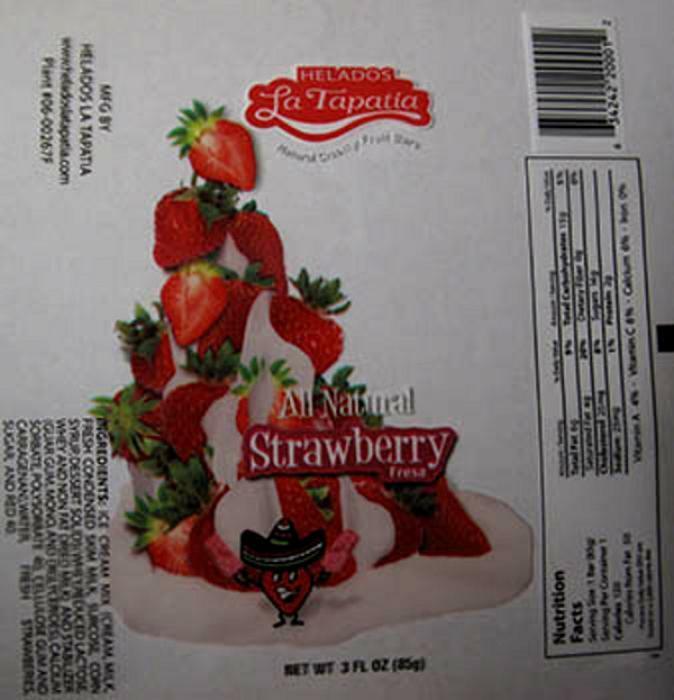 Helados La Tapatia of Fresno, Calif., is recalling all ice cream products, popsicles, fruit bars/cups and bolis. The products were sold in retail stores in Arizona, California, Nevada, Washington, Guam and Canada under the brand names of Helados La Tapatia and Icesations. No illnesses have been reported to date. The recall was the result of a routine inspection program by the U.S. FDA which revealed the presence of the bacteria on certain food processing equipment. Consumers with questions may contact the company at 1-559-441-1105, toll free at1-855-893-1171 Monday through Friday, 6:00 a.m.- 5:00 p.m. (PDT); Saturday, 9:00a.m.- 5:00p.m. (PDT), or by email at helatapatia@sbcglobal.net. Five Star Shellfish is recalling its brand of large standard and mixed oysters due to possible Salmonella contamination. No reported illnesses have been reported. Customers who purchased the recalled should should not consume them, but throw them away or return them to the store where purchased. 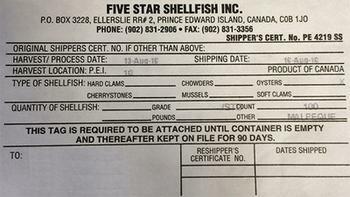 Consumers with questions may call Five Star Shellfish at 902-831-2906. 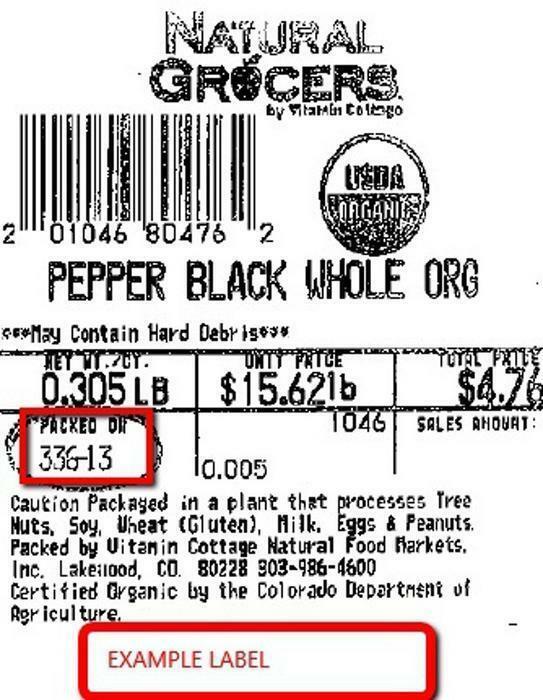 Vitamin Cottage Natural Food Markets of Lakewood, Colo., is recalling multiple lots of Natural Grocers brand Organic Black Peppercorns. The product has the potential to be contaminated with Salmonella. The recalled product is packaged in clear plastic bags with Natural Grocers label notating Julian pack on dates and pricing per pound. The lots identified by Julian packed on date include: 28-14, 13-14, 351-13, 336-13, 322-13, 305-13, 290-13, 281-13, 266-13, 252-13, 245-13. The product was distributed to Natural Grocers’ 80 stores located in Arizona, Colorado, Idaho, Kansas, Missouri, Montana, Nebraska, New Mexico, Oklahoma, Oregon, Texas, Utah and Wyoming. Specific locations of the stores can be found at: http://www.naturalgrocers.com/store-locations. Consumers with questions may call customer service at 303-986-4600, ext. 531 Monday through Friday 8:00 A.M. to 5:00 P.M. (MST). 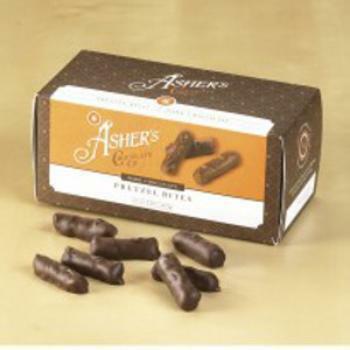 Asher’s Chocolates/Lewistown, Inc., is recalling multiple chocolates, chocolate bars, cellophane wrapped chocolates and individually wrapped chocolates, etc. under the Asher’s brand. The recalled items, distributed in retail stores nationwide, can be identified by the production code printed on the side of the label. No other production codes are affected by this recall. Customers who purchased the recalled products should not consume them, but contact customer service to arrange for return of the products and a refund. Consumers may contact the company at 888-288-3880 between 9AM and 5PM (ET) Monday – Friday or by email at customerservice@lewistownashers.com. 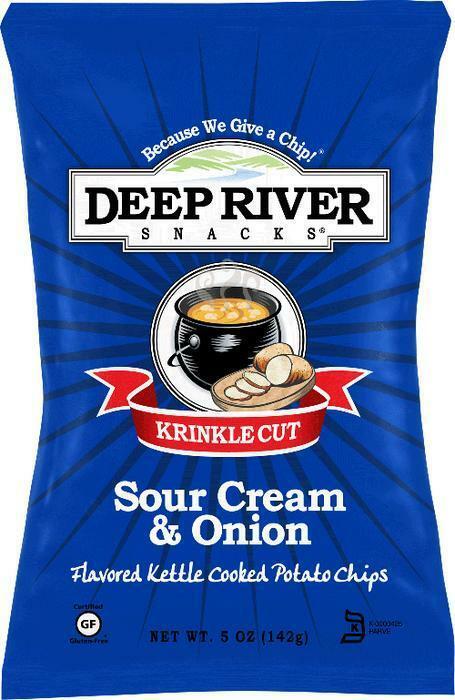 Deep River Snacks is recalling certain Sour Cream & Onion Kettle Chips. The buttermilk powder used in the seasoning may contain traces of Salmonella. The item UPC number can be found on the back of the bag underneath the bar code. The best by date is printed on the front of the bag, in the upper right quadrant near the Deep River Snacks logo. The best by date is printed in the format: DD MMM YYYY (e.g. 10 DEC 2016). Customers who have purchased the recalled product should immediately discontinue use of it. Consumers with questions may contact the company at 860-434-7347, Monday through Friday between 9am – 5pm (EST). Lisy Corporation of Miami, Fla., is recalling Lisy Sweet Basil (Albahaca), 6 oz jar, Item #1132, Lot #'s A013 0518 & A014 0518. Distribution of the recalled product began on 01/15/2014 in retail stores in New Jersey, New York, Rhode Island and Maryland. Consumers who have purchased Lisy Sweet Basil (Albahaca) are urged not to eat the product, and dispose of it or return product to the place of purchase for a replacement or for a full refund. Consumers with questions may contact Henry Rosen at 305-836-6001 ext. 233 Monday through Friday from 8:00 am – 5:00 pm EST. Fourth Street Barbecue is recalling Cheese Club Express Mac & Cheese 4-cup dinner and Double Takes Macaroni & Cheese 2-cup dinner. Customers who purchased the recalled products not consume them. Consumers seeking a replacement or refund may call the customer hotline at 724-483-2056, Monday – Friday 8:00 am – 5:00 pm (EST). H-E-B is recalling both bulk and packaged raw shelled pistachios that may be contaminated with Salmonella. There have been no reports of illness to date and all product has been removed from stores. The recalled products come in prepackaged plastic containers containing raw pistachios with labels reading Shelled Pistachios or Central Market Shelled Pistachios, as well as pistachios found in the bulk section with SunRidge Farms labels reading: Women’s Vitality Mix, Pistachio Nuts and Dark Chocolate Pistachios. Customers who purchased the recalled products should return them to the store for a full refund. Consumers with questions or concerns may contact H-E-B customer service at 1-855-432-4438, Monday through Friday from 8 a.m. to 8 p.m. (CST). 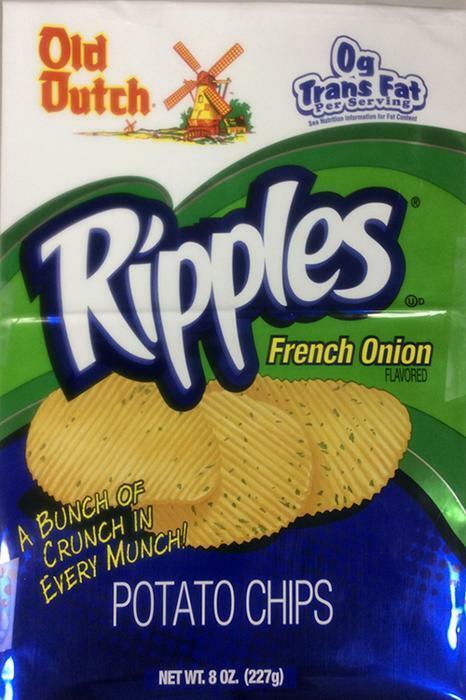 Old Dutch Foods of St. Paul, Minn., is recalling a limited number of flavored potato chip and tortilla chip products. Customers who purchased the recalled products should dispose of them immediately. Consumers may contact Old Dutch Foods consumer care toll free at 1-877-228-2273 between 9:00am and 5:00pm (CST). 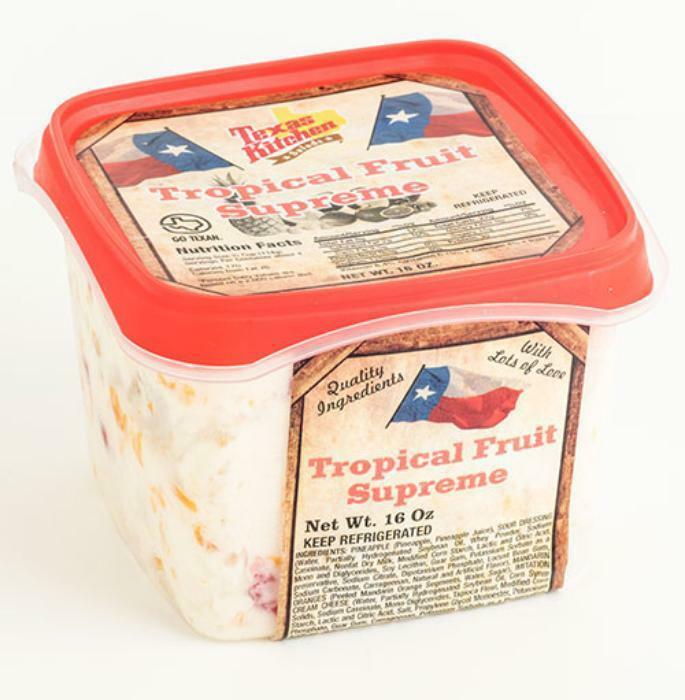 Ron’s Home Style Foods is recalling Tropical Fruit Supreme, Pineapple Nut Delight, and Pistachio Crème. Consumers with questions may contact the company at (800) 856-3131, M-F 8am-4pm CST. 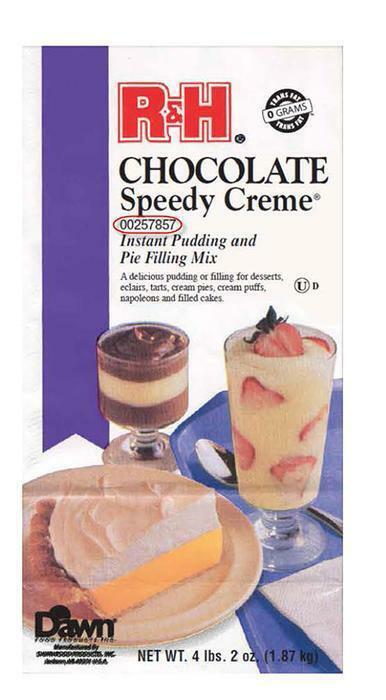 Poppies International of Battleboro, N.C., is recalling pastry products made with custard powder that may be contaminated with Salmonella. Customers who purchased the recalled products should immediately discontinue use of the product and return it to the place of purchase for a full refund. Consumers with questions may contact Heather Aycock at 252-442-4016 Monday through Friday between 9am-5pm (EST) or by email at info@delizza.us. H-E-B, in cooperation with Dawn Food Products, is recalling certain bakery products that may be contaminated with Salmonella. There have been no reports of illness to date in connection with these items. Swanson Health Products of Fargo, N.D., is recalling Swanson Premium Brand Full Spectrum Cilantro (Coriander), item number SW1112. The product was sold between November 21, 2013, and January 31, 2014, at the Swanson Health Products retail store in Fargo, shipped directly to online or mail-order consumers, or held for pick up by the consumer at Swanson Health Products headquarters. The lot numbers of Swanson Premium Brand Full Spectrum Cilantro (Coriander) included in this recall are 203921 and 204888, with a manufacturing date of 11/2013. The lot number and manufacturing date can be found on the label near the UPC code. Consumers in possession of the recalled product may return it to Swanson Health Products headquarters in Fargo, North Dakota. Consumers or media with questions may call (800) 451-9304 (Monday–Friday, 8:00 am–5:00 pm CDT). Dawn Food Products of Jackson, Mississippi, is recalling limited quantities of bakery mix products that may be contaminated with Salmonella. The products were produced from May 19, 2016, through October 5, 2016. Customers who purchased these products should return them to the place of purchase for proper credit. 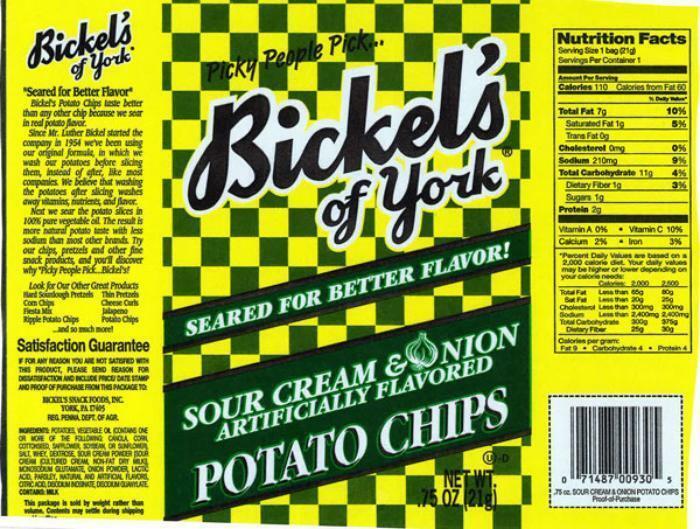 Bickel's Snack Foods of York, Pa., is recalling a variety of snack products. Consumers with questions may contact Bickel's toll free at 1-800-888-4646 Monday through Friday between 8:00am and 5:00pm. (EST). 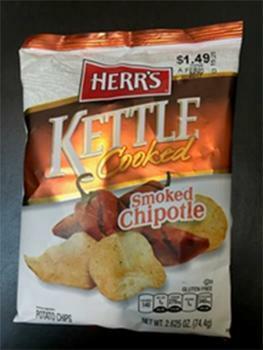 Herr Foods is recalling Smoked Chipotle flavored Kettle Cooked Potato Chips and Smoke Dried Chipotle flavored Kettle Cooked Potato Chips sold under the Peddler’s Pantry brand. The products are packaged in gold, white and brown metalized bags, with the lot number on the front of the package in the upper right hand corner and the UPC number on the lower right hand corner of the back panel of the package. Consumers with questions may call 1-800-523-5030 from 9am- 5pm (EST) Monday through Friday. 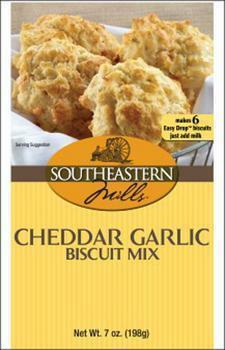 Southeastern Mills is recalling Southeastern Mills Biscuit Gravy Mix, Southeastern Mills Country Biscuit Mix, Southeastern Mills Buttermilk Drop Biscuit Mix, Southeastern Mills Easy Drop Cheddar Garlic Drop Biscuit Mix Shore Lunch Original Breading and Shore Lunch Cajun Style Breading. Customers who purchased the recalled products should discontinue using them and return them to the place of purchase for a full refund. Consumers with questions may contact the company at 1-800-334-4468, 8 am - 5 pm (EST) daily or by e-mail at fda@semills.com. 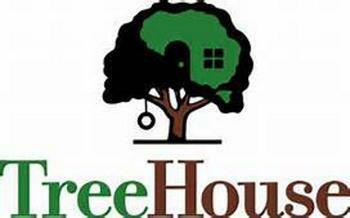 TreeHouse Foods is amending the “best by” dates used in its December 2016, recall of macaroni and cheese cup products. The products contain cheddar cheese seasoning that may be contaminated with Salmonella. Customers who purchased the recalled products should dispose of or return them to the place of purchase for a full refund. Consumers with questions may call 1-800-756-5781, Monday – Friday, 7:00 a.m.– 6:00 p.m. (CST). Palmer Candy Company is recalling of certain chocolate products that may be contaminated with Salmonella. The UPC #s are usually on the back of the bag or bottom of containers. The Agriculture Department’s Food Safety and Inspection Service (FSIS) says it's unleashing a new bevy of weapons to fight what it calls “the most pressing problem” it faces -- Salmonella in meat and poultry products, which it says is responsible for an estimated 1.3 million illnesses every year. The agency says its Salmonella Action Plan is a strategy “to best address the threat of Salmonella in meat and poultry products.” The plan is designed to identify modernizing the outdated poultry slaughter inspection system as a top priority. By focusing inspectors’ duties solely on food safety, FSIS believes at least 5,000 illnesses can be prevented each year. 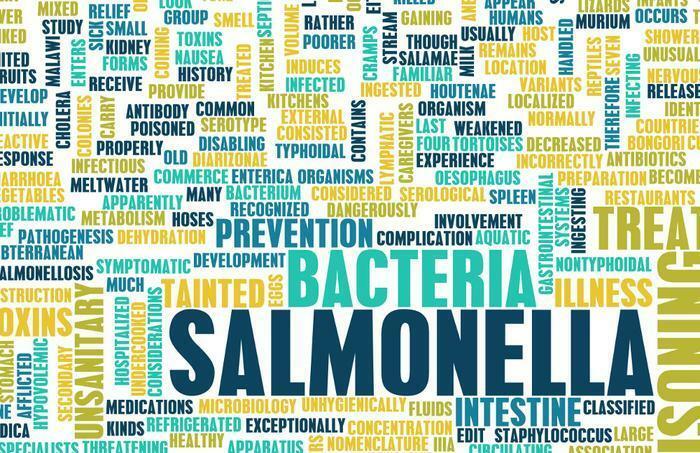 Enhancing Salmonellasampling and testing programs is also part of this effort, which is expected to ensure that these programs factor in the latest scientific information available and account for emerging trends in foodborne illness. Inspectors will also be given the tools necessary to pinpoint problems expeditiously. In addition, the plan outlines several actions FSIS will take to drive innovations that will lower Salmonellacontamination rates, including establishing new performance standards; developing new strategies for inspection and throughout the full farm-to-table continuum; addressing all potential sources of Salmonella;and focusing the Agency’s education and outreach tools on Salmonella. These efforts will build upon the work that USDA has done over the past several years. In 2011, USDA strengthened the performance standards for Salmonella in poultry with a goal of significantly reducing illnesses by 20,000 per year. And through the SalmonellaInitiative Program, plants are now using processing techniques designed to directly reduce Salmonellain raw meat and poultry. Thanks to these innovative technologies and tough policies, Salmonella rates in young chickens have dropped over 75 percent since 2006. Fernandez Chile Company Inc of Alamosa, Colo., is recalling 4-oz Chile Molido Puro UPC code 77601-10011 and 6-oz Chile Rojo UPC code 77601-10053. The recalled products were distributed to King Soopers, Safeway, City Market and various independent grocers in Colorado, New Mexico, Wyoming, Utah, Arizona and California. The 4-oz Chile Molido Puro UPC code 77601-10011 comes in a clear plastic bag marked with an expiration of 01 2017 on the back. The 6-oz Chile Rojo UPC code 77601-10053 comes in a clear plastic bag marked with an expiration 02 2017 on the back. Consumers who have purchased these products should return them to the place of purchase for a full refund. Conagra Brands is recalling a limited amount of Hunt’s Chili Kits. The chili seasoning packet contained in the kit may be contaminated with Salmonella. There have been no reports of adverse reactions or injuries due to consumption of this product to date. The product code information is on the bottom of the kit below the barcode. Customers who purchased the recalled products should not consume it, but return it to the store where originally purchased. Consumers with questions may call the consumer affairs hotline at 1-800-921-7404, from 9 am through 5 pm (CDT), Monday through Friday. Nutriom LLC of Lacey, Wash., is recalling approximately 226,710 pounds of processed egg products that may be contaminated with Salmonella. There have been no reports of illnesses due to consumption of these products. The dried egg products were produced between Feb. 28, 2013, and Feb. 8, 2014, and bear the establishment number “INSPECTED EGG PRODUCTS PLANT 21493G” inside the USDA Mark of Inspection. These products were shipped nationwide and to U.S. military installations in the U. S. and abroad, as well as to Canada. Consumers with questions regarding the recall may contact Julie Cuffee, customer service representative, at (360) 413-7269, ext. 101. 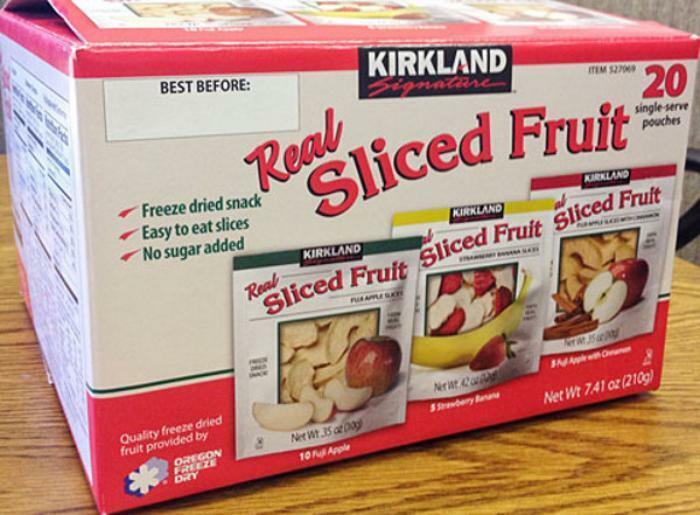 Oregon Freeze Dry of Albany, Ore., is recalling 59,780 cases of Kirkland Signature Real Sliced Fruit, produced exclusively for Costco Wholesale Stores. No confirmed cases of Salmonella poisoning from consumption of this product have been reported at this time. Consumers who may have purchased the product were contacted by phone and U.S. mail, and a letter was posted on the Costco website. Furthermore, the affected product was removed from Costco floors. No other products made by Oregon Freeze Dry, Inc. are affected. Kirkland Signature Real Sliced Fruit is sold in a red and white case containing 20 pouches of freeze-dried snacks. Consumers who have purchased Kirkland Signature Real Sliced Fruit with the following “Best Before Dates,” which are listed on the upper left corner of the front panel of the case, should return the product to the place of purchase for a full refund. Cases of the potentially contaminated Kirkland Signature Real Sliced Fruit were distributed to Costco Wholesale stores in the following locations: Alabama, Arizona, California, Colorado, Connecticut, Delaware, Florida, Georgia, Hawaii, Illinois, Indiana, Iowa, Kansas, Kentucky, Maryland, Massachusetts, Michigan, Minnesota, Missouri, Nebraska, Nevada, New Hampshire, New Jersey, New Mexico, New York, North Carolina, North Dakota, Ohio, Pennsylvania, South Carolina, South Dakota, Tennessee, Utah, Vermont, Virginia, Wisconsin and Puerto Rico. Customers with questions may contact the company at recall@ofd.com. or 1-888-641-2933 Monday through Friday, 8:00 AM to 5:00 PM PDT. 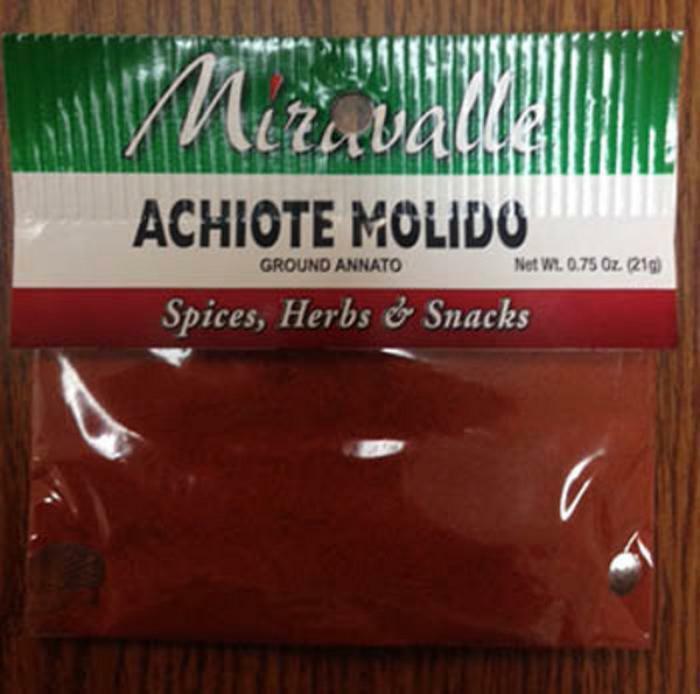 Miravalle Foods of El Monte, Calif., is recalling its 0.75-ounce packages of Miravalle brand Achiote Molido Ground Annato spice. The recalled packages of Ground Annato 0.75 oz. were distributed in retail stores in California, Utah, Idaho, Colorado, Nevada, Washington and Oregon. Consumers with questions may contact the company at 626-575-7551, Monday through Friday 8AM to 4:30PM PT. PDX Aromatics of Portland, Ore., doing business as Kraken Kratom, Phytoextractum, and Soul Speciosa, is recalling kratom-containing powder products. One confirmed illness has been associated with the recalled products. The federal Food Safety and Inspection Service (FSIS) is taking matters into its own hands. The agency is issuing a public health alert because Nutriom LLC of Lacey, Wash., has declined to expand a recall issued in February to include an additional 118,541 pounds of processed egg products. FSIS says there is reason to conclude that they are unfit for human consumption. The request for expansion was based on evidence collected during an investigation conducted by FSIS. The company, according to the agency, has refused to recall the additional processed egg products. As a consequence, FSIS intends to take appropriate action to remove the products from commerce. FSIS issued the original recall because the company allegedly recorded false laboratory results. The company also allegedly produced negative laboratory results for Salmonella when the results were actually positive, or reported that sampling had occurred when, in fact, no microbial testing was performed. FSIS asked the company to include additional products, but it declined. Because the product was not produced in accordance with FSIS requirements, it has been declared unfit for human consumption. The dried egg products were produced from May 2013, through January 2014, and bear the establishment number “INSPECTED EGG PRODUCTS PLANT 21493G” inside the USDA Mark of Inspection. They were shipped nationwide and to U.S. military installations in the U.S. and abroad, and to Mexico. PDX Aromatics, doing business as Kraken Kratom, Phytoextractum, and Soul Speciosa, is expanding its earlier recall of certain kratom white vein powder and capsule products and red vein powder products.